Pgpool-II needs to access PostgreSQL's system catalogs whenever it recognizes tables in user's query. For example, Pgpool-II has to know whether the table in question is a temporary table or not. If it's a temporary table, then the query using the temporary table must be routed to the primary PostgreSQL, rather than one of standby PostgreSQL servers because PostgreSQL does not allow to create temporary tables on standby servers. Another use case is converting the table name to OID (Object Identifier). OIDs are unique keys for objects managed in PostgreSQL's system catalogs. Sometimes Pgpool-II needs to issue up to as many as 10 queries to the system catalog when it sees a table or function for the first time. Fortunately Pgpool-II does not wast the query results. They are stored in local cache (wee call it "Relation Cache" or "Relcache"), and next time it sees the object in the same or different queries, it extracts info from the local cache . So far so good. How to mitigate the problem? One of the solutions would be sharing the relation cache info among Pgpool-II processes. This way, once one of the processes accesses the system catalogs and obtains the info, other processes do not need to access the system catalogs any more. The cache shared by the processes is called "shared relation cache". If the table/function info is not in the local relation cache, check the shared relation cache. If the table/function info is already in the shared relation cache, just copy the info to the local cache. You might wonder why there are two kinds of cache: local one and shared one. The reason is locking. Since local cache is never be accessed by multiple processes, it does not need any locking, while the shared relation cache can be accessed by multiple processes, it must be guarded by locking, and this could be a serious bottle neck if there are many processes. Any cache needs to be invalidated someday. In the current implementation the cache invalidation is based on timeout. The timeout value can be specified using "relcache_expire" parameter, which controls the local cache timeout as well. Is shared relation cache is faster? Well, it depends on use cases. If there are very small number of tables or functions, overhead of new shared relation cache will not give advantages. However there are many tables/functions, definitely it wins. This is the reason why Pgpool-II has a switch (enabled_shared_relcache) to enable or disable the feature. pgbench ran 3 times for each session and I used the average of the numbers. The script file includes 1-128 SELECTs to access each table. The blue line (Speed = 1) is the base line, i.e. when the feature is disabled. The red line is when the feature is enabled. As you can see as the number of tables increases, performance increases as well, up to 32 tables. 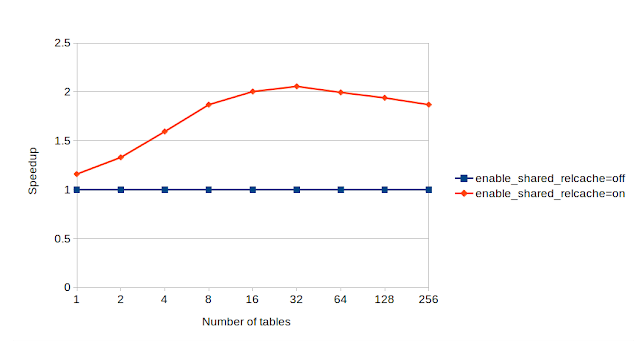 As the number of tables increases, performance is getting lower but still the performance when shared relcache being on is superior than off. The result may differ according to the workload: if the SELECT is heavy, then the effect may be weaken because the longer access time of SELECT hides the effect of shared relache. The feature is already comitted into Pgpool-II version 4.1, which is supposed to be released around September 2019. So stay tuned!